I couldn’t help feeling like I’d cheated. An hour ago I’d boarded a shuttle to be delivered 3,214ft up from Yosemite’s valley floor to its granite peaks at Glacier Point. Winding up the road, I’d watched towering pines blur past the windows and quickly dissolve into the immensity of the glacier-hewn landscape. Stubborn clumps of muddy snow clinging to the shadows of rocks and tree trunks gave way to swaths of white as we’d continued to climb higher. Stepping from the shuttle I’d been surprised by the sharpness of the air and the view; the valley had been warm, suffused with a golden light. Up among the peaks that richness had thinned, as if the granite itself had sliced through the sun’s lustrous veil and revealed majesty, elemental and incisive. But I hadn’t done anything to earn the privilege of bearing witness to that majesty, nor did I feel able to truly grasp and absorb it. That day in Yosemite was the first time I saw the most famous and imposing of the park’s granite peaks—Half Dome. A veritable Sphinx, Half Dome presides over Yosemite with aplomb, a paradox of brutish grace. Peering across Glacier Point through binoculars I saw tiny figures swarming ant-like across the hump of its peak. I was stunned. It seemed an impossible summit—a sheer wall flanked by steep curving slopes that formed the “half” of the monolith’s namesake shape. I wanted to reach that summit. I wanted to depart from the cocoon of the valley floor and push, push, push against gravity’s tight embrace. Step after step, I wanted to feel the subtle shift in temperature and smell the change in vegetation as the miles and elevation passed slowly underfoot; syncing senses with landscape. I wanted to be steeped in Yosemite’s sublimity as it slowly unfurled. 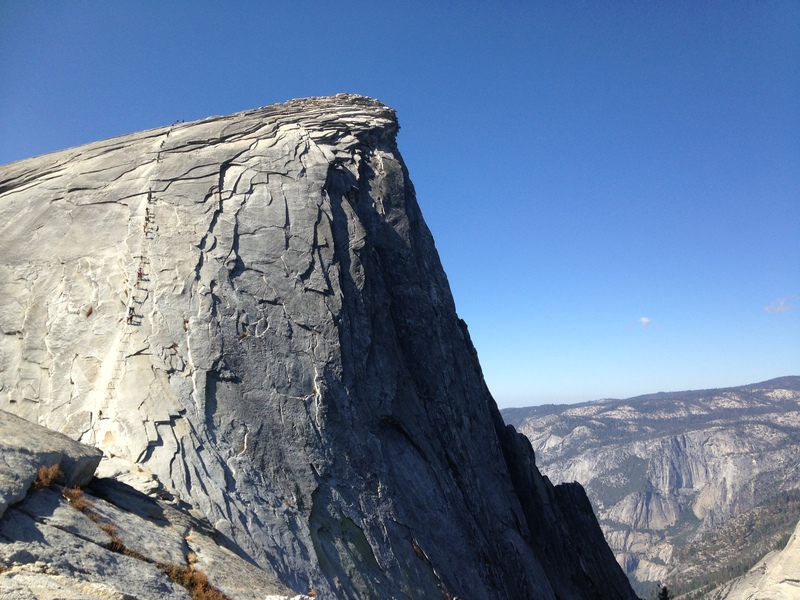 Three years after that first visit I finally made the ascent to Half Dome. 17 miles round trip with 4,800ft elevation gain. It mangled my toes, turned my legs to jelly, tested my patience, and sapped my energy to near totality …and I loved it. 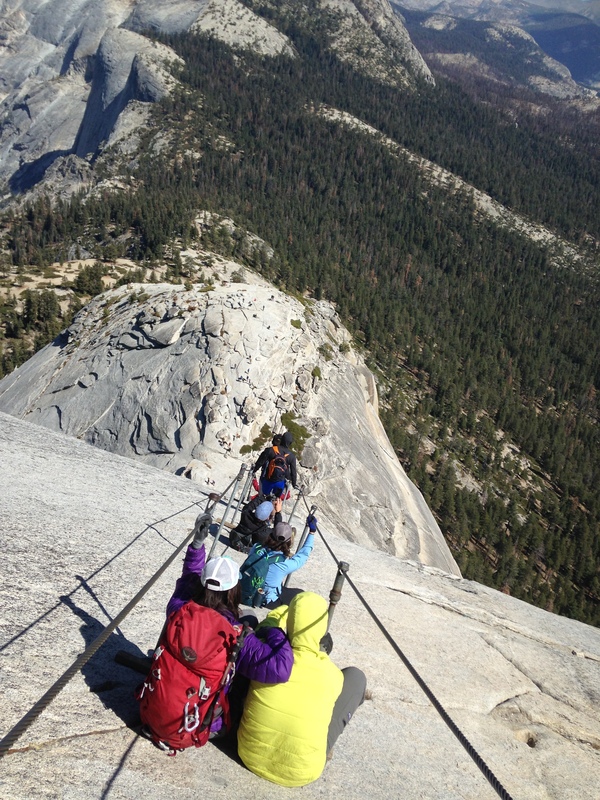 Climbing Half Dome is by permit only. You can learn about the permit lottery and plan your hike by visiting the Yosemite National Park website.